From foul smelling spray to dug up holes in the ground, skunks are known for causing a lot of trouble in homes. These pests belong to the weasel family and can be dangerous if left inside homes. Skunks living in homes close to humans can be a serious health threat. These pests can carry rabies, a disease that causes inflammation in the brain, resulting in loss of life. Therefore, if you see a skunk in your yard or the basement, make sure you call a professional for skunk removal in Westchester County New York. 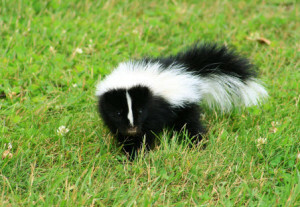 When you hear of skunks, the first thing to come to mind is their foul smelling spray. Skunks spray anyone they feel threatened from. The oily liquid that they spray contains sulfur that can blind people and pets. This means that having a skunk in your house is not only dangerous for you, but also your pets. So, call a professional for skunk control in Westchester for humane skunk removal from your property. If there are skunks living in your house, they will dig up your lawn in search of insect larvae. Their search for food will result in destroyed grass, broken plants, and holes in your lawn. Skunks are always on the lookout for warm shelters to build nests. therefore, if you find your property’s structure damaged from the foundation, it means there is a skunk or any other pest building a nest in your basement. Skunks dig holes in the foundation of homes to get into the basement. They will tear off anything including decks, sheds, and porches to find a place to build a nest. Having a dangerous pest like this residing inside your home is life threatening. therefore, it is best to call a skunk removal professional to do the job. Skunk professionals perform safe skunk removal by trapping them in cages and releasing them in the wild. Pinnacle Wildlife Control is one such skunk and Pest Removal Company that can help solve your skunk problem in less time than anyone else out there. Contact Pinnacle Wildlife Control for professional skunk removal and control services.